Droughts are common in the semi-arid areas of Ethiopia and adversely influence the wellbeing of many of the 80% of the population involved in agriculture. The introduction of any strategy that could increase crop yields would therefore be advantageous. The objective of the study was to attempt to assess the benefit that the in-field rainwater harvesting (IRWH) crop production technique would have, compared to conventional tillage, on increasing soil water, and therefore the yield of a crop, on a semi-arid ecotope at Mieso. The mean annual rainfall at Mieso is 738 mm. The soil is a Hypo Calcic Vertisol with a high clay and silt content and is very susceptible to crusting. To achieve the objective of the study, rainfall-runoff measurements were made during 2003 and 2004 on 2 m x 2 m plots provided with a runoff measuring system, and replicated 3 times for each treatment. There were 2 treatments: conventional tillage (CT) that simulated the normal local CT; and a flat surface simulating the no-till IRWH technique (NT). Rainfall intensity was measured at 1-min intervals and runoff was measured after each storm. The Morin and Cluff runoff model was calibrated and validated using measured rainfall-runoff data. Appropriate values for final infiltration rate (If), surface storage (SD) and the crusting parameter (y) were found to be: 10 mm-hr-1; 2 mm for NT and 5 mm for CT; 0.4 mm-1; respectively. The runoff (R)/rainfall (P) ratio (R/P) gave values of 0.43 and 0.34 for the NT and CT treatments, respectively. There was a statistical difference between the runoff on the 2 treatments. The first estimated yield benefit of IRWH compared to CT is 455 kg-ha-1. Based on the average long-term maize yield of 2 000 kg-ha-1 at Melkassa, this is an estimated yield increase of 23%. Crop production in Ethiopia is mostly under rain-fed conditions, most of which is marginalised by water stress (MoA, 2000). The optimum utilisation of rainwater is therefore of utmost importance. This entails improving rainwater productivity (RWP), recently defined by Botha (2006) as the total long-term grain yield divided by total long-term rainfall. Crop production systems employing rainwater harvesting have been shown by many workers in Africa to result in significant crop yield increases (Mwakalila and Hatibu, 1993; Kronen, 1994; Gicheru, et al., 1998; Ojasvi, et al., 1999). A technique that has given good results in a semi-arid area of South Africa is in-field rainwater harvesting (IRWH) as described in Fig. 1 (Hensley, et al., 2000). This technique is also known as mini-catchment runoff farming (Oweis et al., 1999). 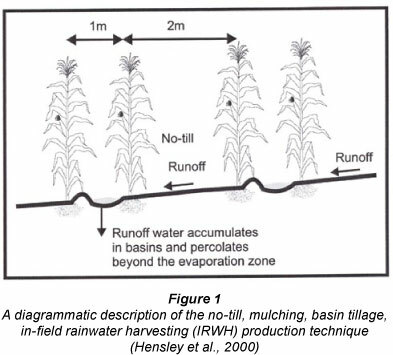 The technique led to maize yield increases of between 25% and 50% and significant increases in RWP compared to conventional tillage, in a semi-arid area on crusting clay and duplex soils that have a high water storage capacity (Botha, et al., 2003; Botha, 2006). Rainfall in semi-arid areas with fine textured soils is mainly lost through evaporation from the soil surface (Es) and runoff (R). Under these conditions Es can be 60-70% of the annual rainfall (Bennie and Hensley, 2001), and R can vary between 8% and 49% of the annual rainfall depending on the prevailing conditions (Haylett, 1960; Du Plessis and Mostert, 1965; Bennie, et al., 1994; Hensley et al., 2000 and Botha et al., 2003). Studies by Morin and Benyamini (1977) and Morin and Cluff (1980) showed that the most important factors influencing runoff in semi-arid areas were: rainfall intensity (Pi); the final infiltration rate of the soil (IÂ), which is greatly decreased by crusting; the extent to which the soil surface can store water before runoff starts, which is described by a parameter termed surface detention (SD); a crusting parameter (γ) describing crusting rate and extent of development. Their studies resulted in the formulation of a runoff model that satisfactorily predicted runoff from crusted soils in Arizona (Morin and Cluff, 1980), and in Israel (Morin, et al., 1983). The model has been successfully used by Zere et al. (2005), for predicting the runoff measured by Du Plessis and Mostert (1965) over 18 years on a Tukulu form soil (Soil Classification Working Group, 1991) at Glen. Details about the model are presented in Welderufael et al. (2009). It has been shown by Anderson (2007), Welderufael et al., (2008) and Welderufael et al., (2009) that the Morin and Cluff (1980) runoff model (MC model) is well suited for predicting the benefits of IRWH for crop production in semi-arid areas with crusted soils. Model details are presented in Welderufael et al. (2009). 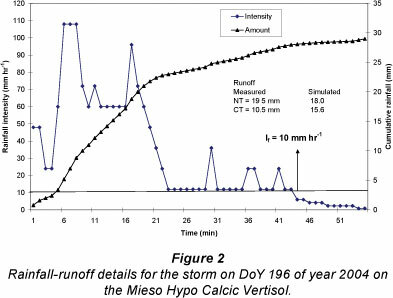 It was therefore concluded that if rainfall-runoff relationships on the Mieso Hypo Calcic Vertisol ecotope could be determined, it would enable researchers to quantify the extent to which the IRWH technique would result in increased yields. Vertisols generally have unique physicochemical characteristics. They have a high smectitic clay content with strong swell-shrink properties. Vertisols produce large cracks during shrinking that only close after prolonged rewetting. These soils became hard when dry and very sticky when wet (Kampes et al., 1981). They generally have a weak horizon differentiation. They also have low hydraulic conductivity, low infiltration rate and high soil water content at field capacity (Virgo and Munro, 1978; Kamara and Haque, 1988c). In spite of these characteristics vertisols in Ethiopia are considered to have a reliable crop production potential if proper soil and water management systems are practiced (Abebe, 1998). Moisture scarcity impacts negatively on crop production at the study ecotope. The annual rainfall is low, only 70% falls during the main cropping season from June to September, and the unique physical and chemical properties of these soils promote soil surface crusting, thus reducing effective infiltration. The in-field rainwater harvesting technique described in Fig. 1 will result in increased crop yields on the Mieso Hypo Calcic Vertisol ecotope in Ethiopia. The MC model will satisfactorily predict runoff on the ecotope. It will be possible to make reasonable estimates of yield increases on the ecotope using IRWH, by predicting the extent of runoff collected in the basins and therefore prevented from leaving the field and becoming unavailable to the crop. 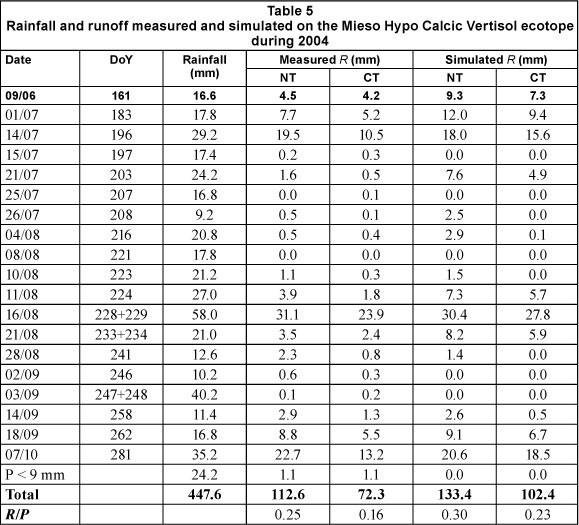 To quantify rainfall-runoff relationships on the semi-arid Mieso ecotope in Ethiopia over 2 rain seasons. To calibrate the MC model for the Mieso ecotope. To estimate, for the Mieso ecotope, the maize yield benefits of using the IRWH technique described in Fig. 1 compared to conventional tillage. Data resulting from the address of the first objective will be used to do this. The study was carried out at Mieso in one of the semi-arid regions of Ethiopia, for the 2 main rain seasons during 2003 and 2004. Mieso is located in the middle part of the Rift Valley at longitude 40.8ºE and latitude 9.23ºN, and an altitude of 1 352 m a.m.s.l. The site chosen represents a gently sloping plain with a slope ranging from 1 to 5%, immediately at the footslope of the Eastern plateau. The ecotope is described by the geographic site name followed by the name of the soil. The soil is classified as a Hypo Calcic Vertisol (WRB classification). The ecotope name is therefore Mieso Hypo Calcic Vertisol. The experiment was carried out at Mieso Agricultural Research sub-station on a field with a slope of 1%. There were 2 treatments and 3 replications in a randomised complete block design. The plot size was 2 m by 2 m. The treatments were: (i) conventional tillage (CT), i.e. the normal/traditional farmer's tillage practice; (ii) no tillage on a flat surface (NT), i.e. simulating the runoff strip of IRWH. On both treatments weeds were controlled by hand weeding. The lower side of each plot was equipped with a runoff collecting device. Each plot was surrounded by a galvanised iron sheet protruding 20-30 cm above the surface of the soil, and inserted to a depth of about 20 cm. This 'wall' served to hydraulically isolate each plot. Runoff was collected in a gutter at the lower side of the plot. The gutter channelled the runoff water into a 200 ℓ barrel buried at the side of each plot. Rainfall-runoff data were collected for each rainfall event. 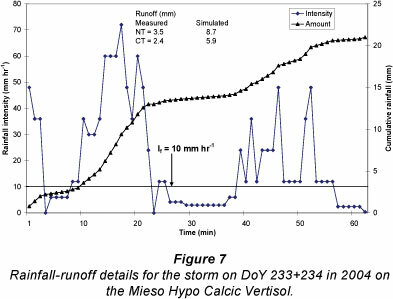 The MC model describes a rainstorm as a group of rain segments for which the breaks in the rain are less than 24 h. Huff (1967) defines a storm as a rain period separated from a preceding and succeeding rainfall event by 6 hours or more. The latter definition was used. During the 2003 rainfall season, runoff collected in the barrel was emptied into a graduated cylinder by successive steps until the barrel had been emptied. In the following year, 2004, runoff was simply measured by recording the height of the runoff inside the barrel. 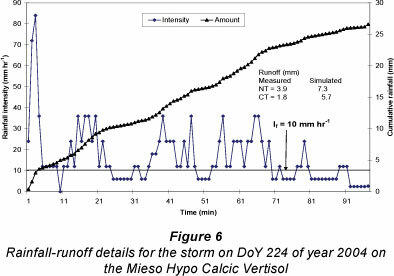 Rainfall amount and intensity were measured at 1-min intervals by an automatic tipping-bucket rain gauge (Hobo Event (C) Onset Computer Corp, Model No. 7, Version No. 4) installed at the experimental site to store detailed data for every storm. The rain gauge is capable of measuring 0.2 mm in 0.01 seconds. The rain gauge was equipped with a data logger with memory capacity of 32 768 bytes. The data was downloaded to a laptop computer. The record included the starting date and time, as well as the terminating date and time, of each storm. The data collected were analysed to characterise each rainstorm during the measuring period. 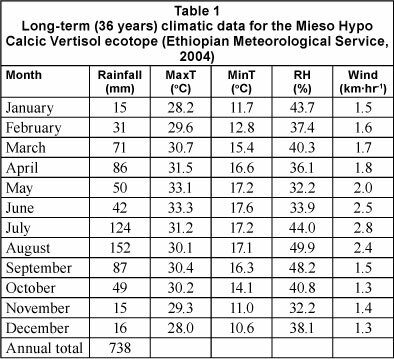 The climatic data for Mieso was compiled from Class A weather station records for the 36-year period, 1967 to 2003 (recorded data of the Ethiopian Meteorological Service at Mieso Research site; Ethiopian Meteorological Service, 2004). Table 1 shows the mean monthly data. The rainfall has 2 peak seasons during the year, March-April and July-September. The March-April peak is unfortunately too short to support crop production. The July-August season has a growing period of about 105 days. The average annual rainfall is 738 mm. Annual potential evapotranspiration is estimated using the Penman-Monteith method to be 1 656 mm which gives a mean annual aridity index of 0.45. The site, according to the agro-ecological zones of Ethiopia (MoA, 2000), is located in the sub-agro-ecological zone of 'hot to warm semi-arid lakes and Rift Valley' (SA1-2), whereas Mamo (2006) classified it more recently under Zone 4, a medium-risk area of the Rift Valley for crop production. A striking climate feature is the small variation in maximum and minimum temperature throughout the year, with no minima below 10°C and no maxima above 34°C. This is presumably due to the closeness of the site to the equator (latitude 9.2°N), coupled with the relatively high altitude (1 352 m). A profile pit was dug to a depth of 2 100 mm. The soil profile was described and classified as follows: Hypo Calcic Vertisol according to the World Resource Base System (FAO, 1998b); Arcadia form, Rustenburg family according to the South African System (Soil Classification Working Group, 1991); Vertisol according to the FAO system (FAO, 1984). A soil map (FAO, 1998a) of the Rift Valley in this vicinity shows the dominance of the Vertisols. An important characteristic of the soil is a favourable high water-holding capacity throughout the profile due to the high clay content. The topsoil is susceptible to crusting. The determined soil physicochemical properties of the study area are presented in Tables 2, 3, and 4. The soil of the Mieso Hypo Calcic Vertisol is relatively homogeneous regarding some of the chemical properties. The pH (KCl) shows an almost neutral soil condition (approx. 6.8) throughout all the horizons. The pH in water (1:1 H2O) showed a slightly alkaline condition with an increasing trend with depth, with values ranging from 7.8 to 8.3. Calcium is very high compared to the Dera and Melkassa soils where similar studies were carried out (Welderufael et al., 2008; Welderufael et al., 2009). This contributed to the high pH and base saturation. Because of the high water-holding capacity of the soil, plus the low permeability and relatively low rainfall, deep drainage is expected to be minimal. The soil has high θ033 and θ15, water contents. This estimate of the total water-holding capacity to the effective soil depth (1 600 mm) was found to be 1 239 mm, and the estimate of plant available water (Δθ) 467 mm (Table 4). Bulk density (Db) was found to be larger for the depths below the Ap horizon (100-2100 mm), increasing at 100 mm from 1.44 to 1.58 Mg-m-3 (Table 4). Similar results were reported by Abebe (1998) for Ethiopia's Sheno and Bale Vertisols, where the plough depth is frequently pulverised by continuous cultivation. Infiltration rate, including initial (Ij) and final (If) infiltration rate, were determined by using a sprinkler infiltrometer. A 6m x 6m plot was prepared with a flat surface, as for the no-till (NT) treatment described in the experimental design section. The determination was carried out according to the method prescribed by Reinders and Louw (1984). The procedure was replicated 2 to 3 times and the results averaged (Welderufael, 2006). The measured rainfall and runoff data were used to calibrate and validate the MC model. Half the data was used for calibration and the other half for validation. The data was used together with the determined values of Ii and If to run the model. The remaining parameters in the model, i.e. maximum surface detention (SDm) and γ were fixed using a sensitivity analysis to obtain 'best fit' values. Model calibration was carried out by changing the values of γ between 0.1 and 0.9 and SDm between 0 and 10 mm, while keeping the measured and first approximation Ii and If values fixed. Once the optimum values for γ and SDm were obtained, a sensitivity analysis was conducted as described by Madsen et al. (2002) to improve the If value until the performance evaluation functions had reached their optimum level, and the observed and simulated runoff values matched reasonably well. Once the model was calibrated and the parameters fixed, validation was carried out on the remaining data using the procedure of Willmott (1981). Rainfall-runoff measurements are presented in Tables 4 and 5. During 2003, measurements could only be started in mid-July, hence there are fewer measurements for 2003 than for 2004, in which the complete rainy season is represented. In 2003 the storms monitored produced total runoff amounts of 63.3 mm and 79.4 mm on the CT and NT plots, respectively, from the total rainfall of 186.6 mm, giving R/P values of 0.34 and 0.43 for the CT and NT plots, respectively. In 2004 runoff amounted to 72 mm and 113 mm on CT and NT plots, respectively, from a total rainfall of 447 mm, giving R/P values of 0.16 and 0.25, respectively. The runoff from the NT treatment was significantly higher than that from the CT treatment at the 0.05 probability level. 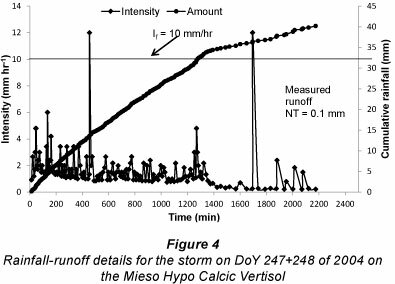 For the calibration and validation of the MC model, only storms with amounts > 9 mm were generally used as runoff from smaller storms was usually minimal. From a total of the 26 storms used during the 2 years, 13 were used to calibrate the model and the other 13 for validation. Results of the infiltration test gave Ij and If values of 75 mm-hr1 and 10 mm-hr1, respectively. Best results for the calibration were obtained using Ij and If values of 80 mm-hr1 and 10 mm-hr1, respectively; γ = 0.4 mm-1 for both treatments; SDm = 5 mm and 2 mm for CT and NT plots, respectively. The statistical results of the validation test of the calibrated model produced the following results for the NT and CT plots, respectively: RMSEu/RMSE ratio, 0.85 and 0.96; D-index, 0.97 and 0.97; R2, 0.91 and 0.89. The MC model was therefore shown to have performed well. The validated model was then used to predict the runoff for all the 26 storms studied over the 2 rainfall seasons. Results are presented in Tables 4 and 5 for the 2003 and 2004 seasons, respectively. There is a noticeable difference in the accuracy of the runoff simulations for the 2 years. Simulated runoff for both NT and CT are in almost all cases considerably lower than measured values for the 2003 season, with the total simulated runoff amounting to only 72% and 66% of the measured runoff for NT and CT, respectively. Measured runoff for the < 9 mm storms has been excluded from these calculations. By contrast, simulations for 2004 were generally too high. Total simulated runoff for the 2004 season amounted to 120% and 144% of measured runoff for NT and CT, respectively. The storms that produced large amounts of runoff on the NT treatment were well simulated during this season, viz. 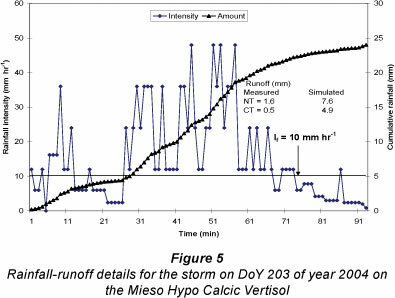 measured versus simulated: 19.5 and 18.0 mm on DoY 196; 31.1 and 30.4 mm for DoY 228 + 229; 22.7 and 20.6 mm for DoY 281. Simulated runoffs on the CT treatment were in all cases too high for these storms. When evaluating these results the difficulties faced by the runoff model need to be kept in mind. During the first season it can be expected that the soil surface would have been considerably rougher on both treatments than during the second season. This could explain the low predictions for the first season and high predictions for the following season, since data for both seasons were used for calibrating the model. Had longer-term rainfall-runoff data been available simulations would probably have been more accurate, especially for later years on the NT treatment, as the crust would have become increasingly stable with time, and therefore the final infiltration rate (If) would remain fairly constant. 78% of which had Pi > If (If = 10 mm-hr1). During this period about 23 mm or 80% of the total rainfall was received. The measured runoff amounted to 19.5 and 10.5 mm from the NT and CT plots, respectively, compared to simulated amounts of 18 mm and 15.6 mm, respectively (Fig. 2). Runoff from the NT plots was predicted well, whereas R for CT was over-predicted. The low amount of measured runoff on CT was promoted by the previous cultivation, which increased the surface storage. Furthermore the long preceding dry period (13 days) would have prevented the formation of a stabilised crust on CT. The NT plots were favoured by the artificially smoothed surface condition that would have enhanced the formation of a well-established crust by the preceding storms on DoY 161 and 183 (Table 2). Relatively good prediction for NT and slight over"prediction of runoff on CT is shown in Fig. 3 for the storm on DoY 229. For CT the model predicted 27.8 mm runoff while the measured runoff was 23.9 mm. The model predicted the runoff reasonably well for storms on DoY 195, 217, and 251 of year 2003; and satisfactorily for most of the 2004 storms (Tables 5 and 6). The model also simulated runoff well for those storms with low intensities (Pi < If) throughout the storm period, e.g. in 2004 on DoY 197, 207, 208, 216, 221, 223, 246, 247 (Table 5). It is therefore not surprising to see storms that have high amounts of low intensity rain ending with trivial or negligible amounts of runoff. The storm on DoY 247+248 of year 2004 (Fig. 4) serves as an example. The importance of Pi as a factor deter" mining runoff is clearly shown. The storm had Pi < If virtually throughout the 2 days of its duration, resulting in close to zero measured or predicted runoff. 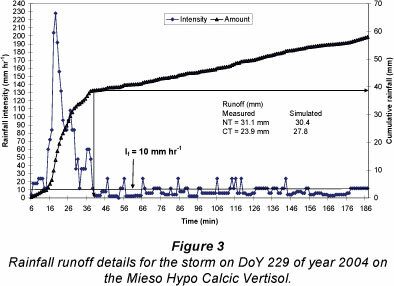 The MC model over-predicted runoff when storms exhibited rapidly fluctuating Pi Examples are storms on DoY 203, 224 and 233+234 in 2004 (Figs. 5, 6 and 7, respectively). During 2003 no storms showed these characteristics. High fluctuation of Pi during storms may cause continuous rearrangement of aggregates that affect the stability of crusts by breaking and remoulding them. These storms may have 2 or more major periods of Pi > If Final infiltration rate may remain high due to the turbulence and scouring effect caused by Pi fluctuation and which may break the sealed crust into smaller aggregates enhancing infiltration and reducing R. It is clear that the MC model could not cope satisfactorily with these variations in If and assumed too low an If value causing simulated R values to be too high (Figs. 5, 6 and 7 and Table 5). The average value of ΔET/Rinf over the 7 seasons was 0.62. This indicates that, on average, on the Glen Bonheim ecotope with maize, ETirwh can be expected to be increased to the extent of (0.62*Rif) above the ET of maize with conventional tillage, i.e. ΔET ≈ 0.62 * Rjf As a first approximation it was considered reasonable to employ this relationship for the Mieso ecotope. Both ecotopes occur in semi-arid areas and both have smectite-rich topsoils. The estimated value for ΔET at Mieso due to employing IRWH compared to CT is therefore obtained by 113 * 0.62 = 70 mm. The multiplication of this AET by the estimated WPET of 6.5 kg-ha-1-mm-1 therefore provides a logical first approximation estimate of the increase in yield to be expected from IRWH on the Mieso Hypo Calcic Vertisol ecotope. The result is 455 kg-ha-1. This is an expected yield increase of 23% over an estimated mean long-term yield of 2 000 kg-ha-1 using CT. The 3 objectives of the study were achieved. Firstly, the MC model was successfully calibrated and validated. Appropriate values for If SDm and γ were respectively found to be: 10 mm-hr1; 5 mm and 2 mm for the CT and NT treatments, respectively; and 0.4 mm-1. Secondly, rainfall-runoff relationships were quantified giving average R/P values of 0.43 and 0.34 for the NT and CT treatments, respectively. There was significantly higher runoff from the NT treatment than from the CT treatment (p < 0.05). Thirdly, annual maize yield benefits using the IRWH technique instead of CT on this ecotope were estimated to be 455 kg-ha-1. accepted in revised form 17 April 2012.